It’s hard to go wrong with Goodfellas. It’s above par in every arena: taste, atmosphere, service, quality to price ratio, location, whisky and wine list… the list goes on. The Italian chef (who also makes his own sauces) ensures that everything you taste is authentic, and the imported ingredients back that up. All of their crispy thin crust pizzas are good, but we recommend the speck tirolese as the best. Pizza Express sounds like the hole in the wall dig that you gained 15 lbs at in college, but (for better or worse) this is not the same place. Fair enough, the Pizza Express chains in Shanghai are good, and less greasy, so hear me out before you kick and shout and click out of the screen. It’s a classic American-Italian diner with all the favorites: bruschetta, garlic bread, prosciutto and melon, Caesar salad, lasagna, spaghetti carbonara, Bolognese, and, as the name suggests, pizza. I absolutely have to recommend the Peking Duck pizza – trust me on this one people, you won’t be disappointed. It’s also worth mentioning they have a vegetarian menu. There’s nothing spectacular about Una’s, but for some reason this ordinary place is always satisfying. Perhaps it’s the location with pleasant outdoor seating right on the edge of a large promenade on Changshu Lu – perfect for people watching and an even better place for enjoying their two-for-one happy hour deals. And for the pizza, well, they get the job done. They’re massive and juicy, and the meat lovers is easily my favorite. They even do a nice Sunday brunch that starts at 11am – be expecting more items like eggs benedict rather than pizza though. Bella Napoli is one of the expat’s favorites. And with Italian owners, a good wine selection, and top shelf ingredients, why wouldn’t it be? Bella Napoli has an open kitchen so you can check out all the dough flopping around (a pepperoni might even come saucer-ing your way), and the pizzas get major brownie points for passing through the stone-fire oven. Try one of their seafood pizzas, rest assured whatever’s on top was swimming a day or two ago. FYI they also have excellent buffalo mozzarella, so anything topped with it will do nothing less than satisfy. DOC’s interior decoration and atmosphere gets a blue ribbon (this actually might be a reason that jacks the prices up though). 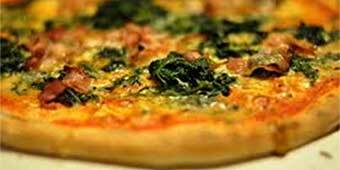 All their pizzas are made from imported Italian flour and water, and roasted in a wood-fire oven. The tiger prawn pizza is hard to beat, but you also can’t go wrong with a simple classic like their margherita. For pasta, try their hand crafted raviolis. It’s a great place for a first date. This no frills, simple joint presents a nice selection of standard pizzas. The wine list is below par (stick with one of their imported beers), and some of the other items on the menu aren’t anything to call home about, but the pizza is tasty enough to make this list. It’s good for a casual/relaxed evening with friends, or even for lunch. The funghi pizza gets rave reviews from diners.